Home » Web-design » What is HTML iFrame and How to Create it? 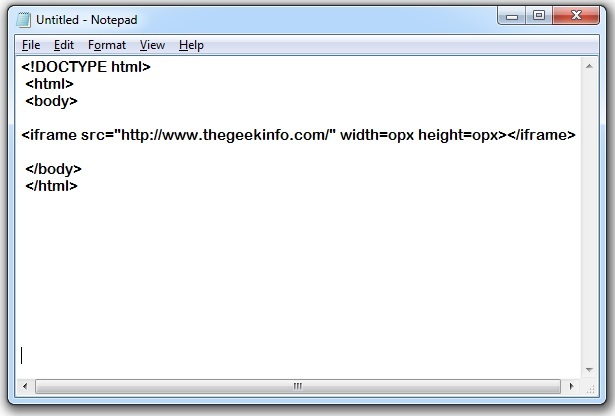 What is HTML iFrame and How to Create it? If you are recently into learning HyperText Markup Language or HTML coding, you may have come across the term "HTML iFrame" a couple of times. The iFrame element used in HTML coding is a very useful and if you are new to the same and would like to know about what actually is this iFrame element in HTML language and how useful can it be to you as a programmer, then below is a detailed article on the same. Going by the definition, what the iFrame does in HTML is that it creates an inline frame, hence shortly termed as iFrame, and this iFrame element helps you to add an independent document of HTML format within the current HTML document. Now you may be confused between the <iframe> and elements as both seems kind of similar. Both of these elements actually represents independent HTML format documents, however, using the <iframe> element makes much more sense than the element as the contents placed inside the <iframe> element is always displayed within the current document, rather than using the <html> element and displaying the content in a separate section at some other part of the webpage. So to sum it up, you can use the <iframe> element when you need to attach any kind of independent HTML document that already is existing, to your present document file. However, if you are building an independent HTML file from scratch, then the <iframe> element is not the best way to attach those HTML files to your current document. If you are a beginner in HTML programming and if you are facing difficulty in creating an HTML iFrame for yourself, then there are many online sites that lets you generate HTML iFrame codes. However, most of these, as expected, comes at a premium and will charge you a sum of money in creating your own HTML iFrame code. Instead, if you are interested in using a free tool that can let you create your own customized iFrame code without any errors or issues, www.iframecodegenerator.com is the best place for all your needs. iFrameCodeGenerator.com helps you in creating your own customized iFrame code by giving all the dimensions and requirements that you have, as input to the tool. For the budding web designers out there, you can also have a preview of the iFrame that you customly created, before actually generating the code of your custom iFrame, so that in case you need to make any more additional customizations you can do it before generating the code itself. If you are interested in knowing in detail on how you can create an iFrame code using the above tool, then below is the steps required to create a custom iFrame for free using iFrame Generator. How to create iFrame Codes for Free using iFrame Generator? First of all, log on to www.iframecodegenerator.com from your web browser. Once the website loads, you will be presented with a list of customization options for your iFrame such as its name, width, height, border size and color, margin width and height etc. After you have given all the necessary requirements to create your own custom iFrame, you can click on the "Preview" button to view a live demo of the iFrame that you just created. If you are satisfied with the live demo, then you can click on the "Generate" button to get the code of the iFrame that you just created. Copy the iFrame code that is displayed in the box below the "Generate" button and you are good to use it in your HTML code wherever required. I hope you found this article on what is an iFrame element in HTML, where do we use iFrame element in HTML and how to easily create an iFrame for free helpful. Do share this article on your social media accounts.